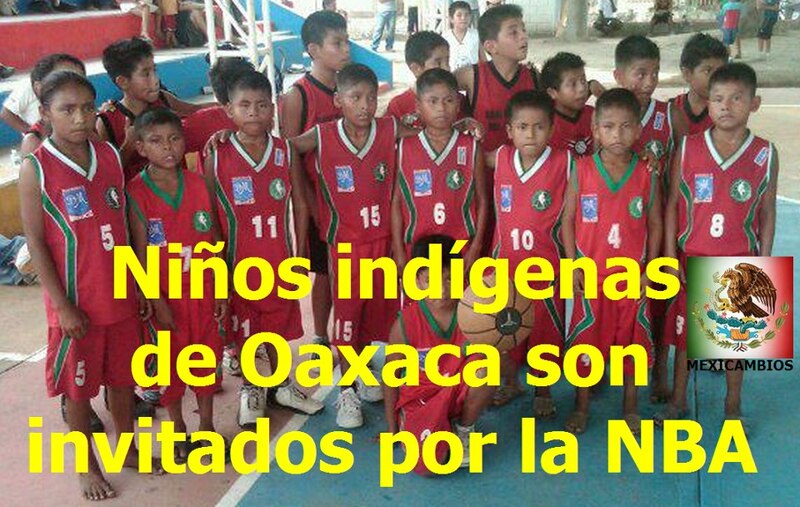 As I’ve mentioned before, Oaxaca is one of the most indigenous and (no surprise) one of the poorest states in Mexico. And, the Triqui of the Mixteca region of Oaxaca are some of the state’s poorest residents. They have recently come to the attention of sports lovers, as a result of the heartwarming story of their youth basketball team, dubbed the Barefoot champions of the mountains. However, while their success story makes us feel good, it is rare. Political violence and poverty continue to chase the Triqui out of their beautiful and ancient mountain communities in search of a better future for their families. And, discrimination continues to follow them into el norte. To add to the strikes against them wherever they go, Spanish is not their native language — the state of Oaxaca is home to 16 distinct ethnolinguistic groups, with Triqui being one. And so, the story of Bernadina Hernandez and her grassroots efforts in Hollister, California should be known, appreciated, and celebrated. Muchisimas gracias a Jody for turning me on to Bernadina’s story. 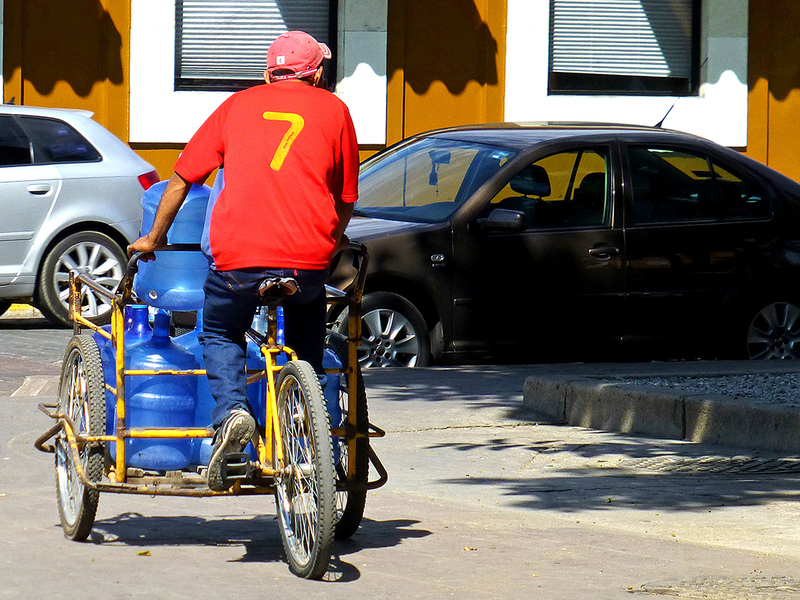 Yesterday, as today’s article in Noticias states, “with great dignity and head held high” the Triqui families from San Juan Copala pulled up stakes and moved to temporary housing in Colonia Reforma. The 105 displaced families had been occupying the front of the Government Palace for several years, but reached an agreement with the state government to relocate. Meanwhile, on the east side of the Government Palace, the band played on… September is “La mes de la patria” (the month of the motherland). Tomorrow night, governor Gabino Cue will repeat El Grito de Independencia (the Cry of Independence) from the balcony of the Government Palace and Monday, an hours-long patriotic parade will pass in front of the Palace. Today, the scene has changed. 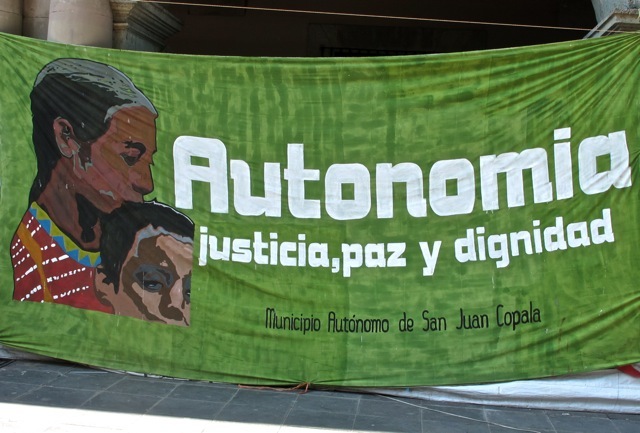 Members of the Frente Único de Lucha (FUL), the new incarnation of APPO, have taken up positions in front of the Government Palace and vowed to remain until those arrested in clashes with the federal police, on December 1 and yesterday in Mexico City, are released. Hmmm… I wonder what will happen tomorrow and/or Monday. Just remember, when you read, hear, or watch the news… Chiapas, Guerrero, and Oaxaca are the most indigenous and poorest states in Mexico. 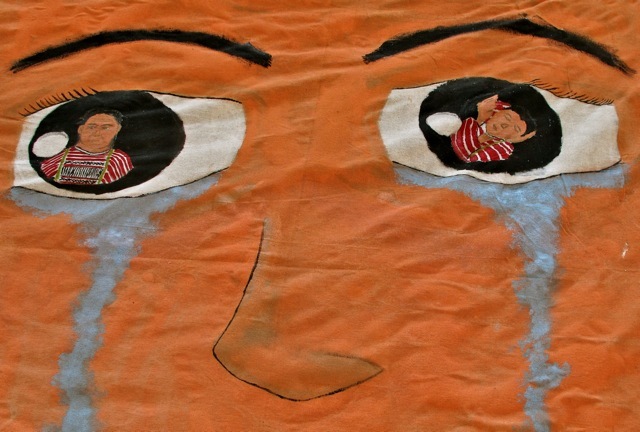 And now, the tears of Mother Nature are raining down on Oaxaca. In the last month, several articles in the US press referencing Oaxaca have been called to my attention. They aren’t the usual travel features enumerating the “10 must see sites,” “best places to stay,” and “local fare dining.” Nor do they cater to the ever more popular fear mongering and demonization of Mexico and her citizens. 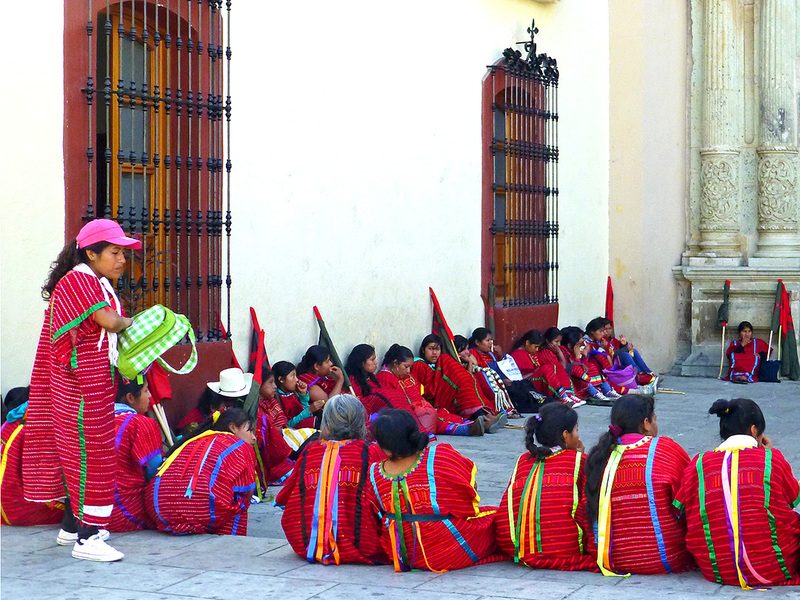 Instead, these articles provide a window on Oaxaca’s indigenous past and challenging present. From the June 15, 2012 New York Times: The Past Has a Presence Here by Edward Rothstein. 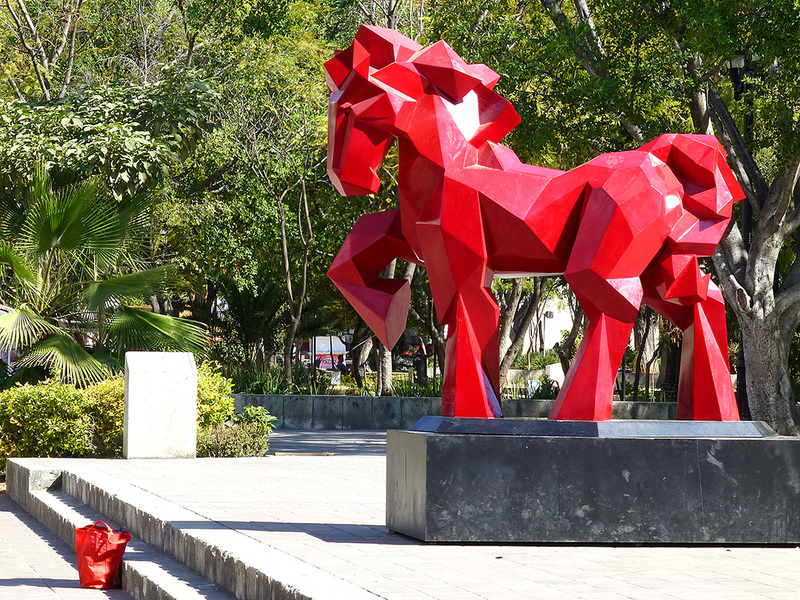 OAXACA, Mexico — The past casts a sharp shadow here, wherever you look. You see it on mountaintop plateaus, where the ruins of ancient pyramidal staircases and capital-I-shaped ball fields hint at mysterious rituals that disappeared over a millennium ago. We are not dealing here with imagined reconstructions, but with the past’s palpable presence. And most of these ancient cities and monuments were abandoned some six centuries before the Spaniards plundered the region. After 80 years of archaeological research, their meanings are still unclear, though much has been written about Zapotec social hierarchies, gladiatorial-style games and stone carvings. 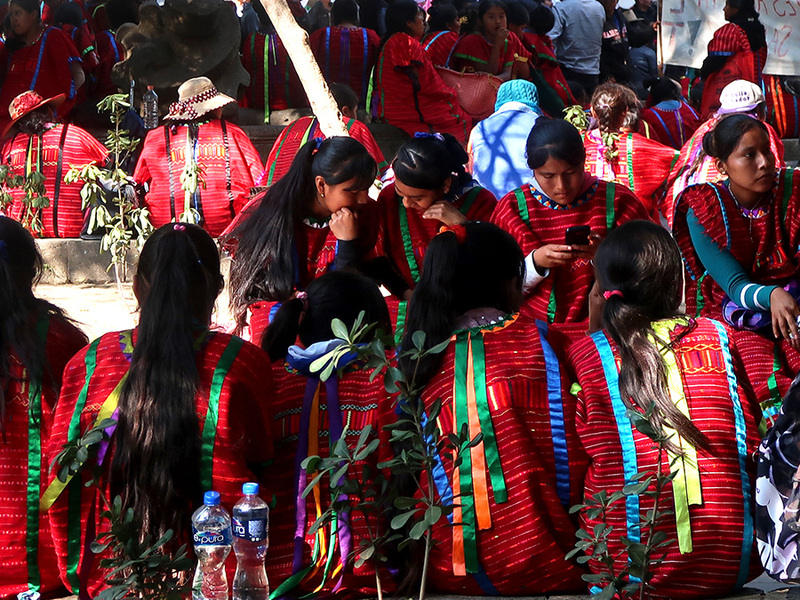 From California’s June 7, 2012 Monterey County Weekly, Native speakers and local missionaries work to save an indigenous Mexican language by Sara Rubin. Gloria Moreno walks with a slight limp under the weight of the black messenger bag slung over her shoulder. It holds something of a botanical encyclopedia, petals and leaves gathered from the streets of Greenfield, which Moreno says help alleviate any number of ailments – pain, anxiety, weak bones. Moreno says her collection is part of a medical tradition she began practicing as a teenager in Mexico. It was there, at 15, that she says she was instructed in a dream to take up herbal medicine. Moreno dreamt her directive in Triqui de la baja, an indigenous language of the Copala region of Oaxaca in southern Mexico. As native Triqui speakers disperse, leaving behind a notoriously violent region, there’s pressure both to preserve that language, and to leave it behind. Of an estimated 40,000 Triqui speakers worldwide, about half of them are thought to have migrated away from Oaxaca, and as many as 10 percent live in the Salinas Valley. Moreno hopes for a generation of trilingual children, but many younger Triqui speakers are encouraged to trade their native tongue for English or Spanish, says a Salinas-based interpreter (who asked not to be named for fear of reprisal), because indigenous Mexicans are viewed as inferior. He trekked two hours to school from his childhood home in Oaxaca where he says he was bullied for being different. To reverse that, he hopes to get a grant or some cash to revive a bimonthly Triqui class piloted at the Greenfield Public Library two years ago. It drew about 35 students; of those, only a quarter were native speakers. The rest, mostly service providers, were there to learn Triqui. And finally from the May 28 Los Angeles Times, Epithet that divides Mexicans is banned by Oxnard school district, by Paloma Esquivel. Rolando Zaragoza, 21, was 15 years old when he came to the United States, enrolled in an Oxnard school and first heard the term “Oaxaquita.” Little Oaxacan, it means — and it was not used kindly. Years later, indigenous leaders are fighting back against an epithet that lingers among immigrants from Mexico, directed at their own compatriots. Earlier this month the Mixteco/Indigena Community Organizing Project in Oxnard launched the “No me llames Oaxaquita” campaign. “Don’t call me little Oaxacan” aims to persuade local school districts to prohibit the words “Oaxaquita” and “indito” (little Indian) from being used on school property, to form committees to combat bullying and to encourage lessons about indigenous Mexican culture and history. 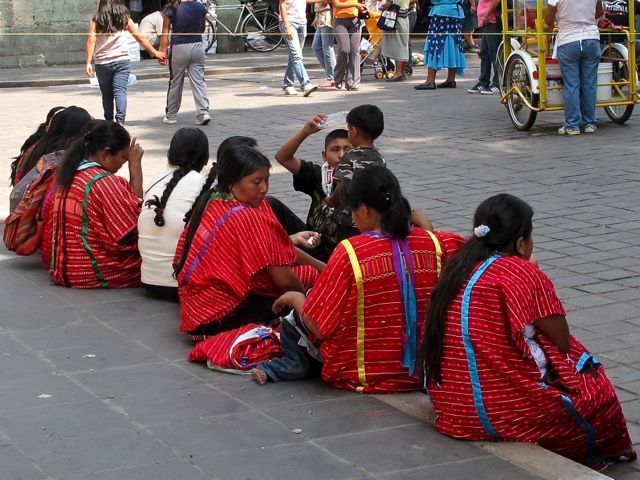 Indigenous Mexicans have come to the U.S. in increasing numbers in the last two decades. Some estimates now put them at 30% of California’s farmworkers. In Ventura County, there are about 20,000 indigenous Mexicans, most of whom are Mixtec from the states of Oaxaca and Guerrero who work in the strawberry industry, according to local organizers. 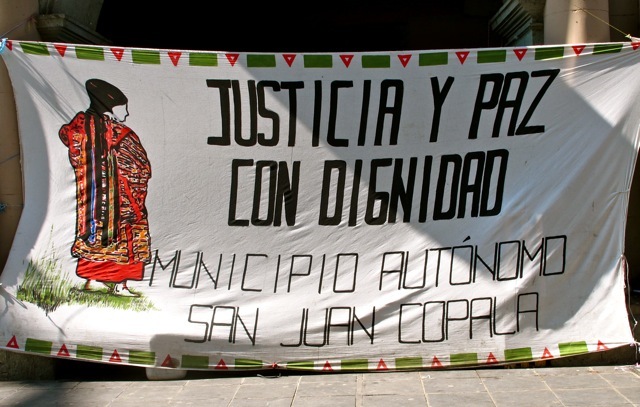 The Marcha del Color de la Sangre (Caravan of the Color of Blood), by the Triqui of San Juan Copala and their supporters, mentioned in my May 23 post, was prevented from entering the village. According to Angry White Kid, a National and International Day of Action in Solidarity with the Autonomous Municipality of San Juan Copala, Oaxaca, Mexico has been called for June 3. 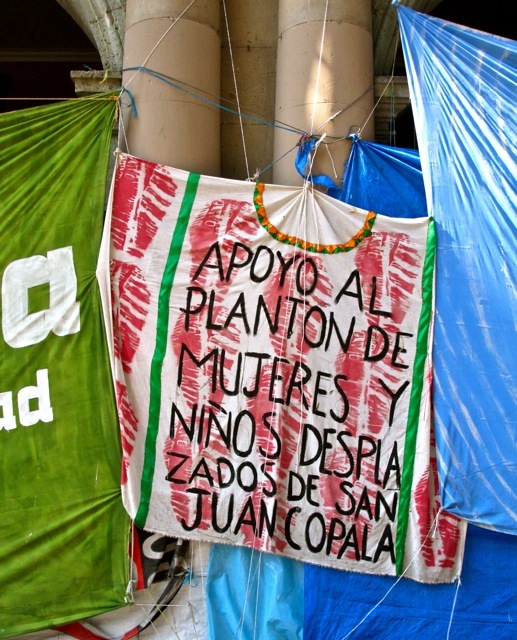 These banners graced the portales of the Government Palace during the encampment.